On November 11, 1918, Harry Gardiner signed some insurance papers at the Bank of Hamilton and purchased a $1,000 bond. But Gardiner wasn’t technically inside the bank at the time. He was outside, dangling far above street level, practicing the little known art of buildering. After completing his business, Gardiner finished scaling the building, as his own personal way of celebrating the end of World War I.
Buildering, or urban climbing, is the practice of scaling buildings. It supposedly began at Cambridge University sometime during the 1800s. However, I imagine that as long as people have created buildings, other people have attempted to climb them. Buildering first reached a wide audience in 1905 when Harry Gardiner began to scale skyscrapers without equipment. Dubbed the “Human Fly” and wearing nothing but clothes, tennis shoes, and rimless spectacles, he climbed over 700 buildings in his life. His feats brought fame to himself as well as to the buildings he conquered. Recognizing a good opportunity when they saw it, companies like the Detroit News started to hire him to climb specific buildings. In 1910, a second builderer started his own career. An owner of a clothing store, looking for publicity, hired George Polley to climb his building. Polley did so and received a suit for his efforts. Soon after, he was traveling the world and scaling buildings. Polley was a born showman and liked to “pretend to lose his grip” while climbing. As the crowd gasped, he’d reach out and grab a windowsill, stopping his descent. Over the course of his 17-year career, Polley is believed to have climbed over 2,000 buildings, including the 406 foot tall Custom Tower in Boston. While Gardiner and Polley were the best known builderers of their era, they weren’t the only ones. Many others attempted to climb buildings, with some suffering tragic falls in the process. It wasn’t long before city officials began to legislate against buildering, turning the previously legitimate exercise into an illegal sport. Still, buildering continues today, most notably the “French Spiderman,” Alain Robert. Earlier this year, Robert scaled the world’s tallest building, the Dubai-based 2,700 foot tall Burj Khalifa. In 2008, I barely missed an opportunity to watch Alain Robert scale the New York Times building and I’ve been kicking myself ever since. The history of buildering is unique, full of personalities, and for the most part, untold. The hero of Chaos, Cy Reed, is a skilled mountain climber. As such, he’s able to bring his skills to bear when he needs to break into the mysterious offices of ShadowFire. Crouching on the sill, I rubbed my sore fingers. Then I carefully edged out of the frame and grabbed hold of a protruding brick. I pulled my feet onto another brick, keeping two points of contact between the building and myself. I moved hard and fast, doing my best to ignore the howling winds and drenching sheets of rain. My fingers and toes danced from bricks to vents to pipes to windowsills. It wasn’t pretty and it wasn’t precise but slowly, very slowly, I ascended the building. I caught a brief rest at the fourth floor and then again at the sixth floor. Feeling renewed, I headed out again, eager to finish the climb. Eager to at last fully understand the Bell. Rain soaked my body as I worked my way up a piece of piping to an outcropping. I lifted myself onto it and edged my way toward another pipe. Suddenly, I heard a crack. Something crumbled under my foot. My hands flailed out, looking for something, anything. Admittedly, things look bad for Cy Reed. But they’re about to get worse…a whole lot worse. If you want to know what happens next, consider picking up your very own copy of Chaos today. Well, that’s it for now. Tomorrow, we’ll be turning our attention to strange science, specifically an exotic material named Red Mercury. Once upon a time, Red Mercury was feared across the globe. Was it a hoax? Or did Red Mercury actually exist? Stop by tomorrow to find out…I hope to see you then! During World War II, Nazi Germany worked on an astounding array of futuristic weapons including heat-seeking missiles, a gigantic 1,000 pound tank, a stealth fighter, and an acoustic cannon. But perhaps the most spectacular and mysterious Nazi super weapon of all was known as die Glocke. Die Glocke is German for “The Bell.” The original die Glocke was constructed from metal, shaped like a bell, and measured 9-12 feet wide and 12-15 feet tall. The Bell contained two counter-rotating drums and an internal stationary shaft. Prior to operation, a liquid substance codenamed “Xerum 525” was placed into the shaft. Then the entire structure was cryogenically cooled and fueled with high-voltage electricity. Now, before I get into what the Bell’s purpose was, I should point out that its very existence remains up for debate. To the best of my knowledge, there is no primacy source documentation that discusses it. Die Glocke was first described by Igor Witkowski in his 2000 book Prawda O Wunderwaffe. Witkowski claims that he learned about the Bell from classified transcripts detailing an interrogation of a former Nazi SS officer. Supposedly, he was only allowed to transcribe the documents. Thus, it remains impossible to verify Witkowski’s story. Die Glocke has since taken on a life of its own, inspiring books by Nick Cook and Joseph P. Farrell, among others. Still, most mainstream scientists doubt the Bell ever existed. They consider it a fabrication and believe that the sole surviving piece of physical evidence, the Henge, is nothing more than the remnants of an industrial cooling tower. Assuming it existed, what was die Glocke? Other than the fact that it was some kind of Nazi wonder weapon, no one knows for certain. A wide variety of answers have been put forth over the years including an antigravity device, a device to create “free energy,” a time traveling machine, and even a machine capable of viewing the past. The seats were punctured with small holes and splattered with bloodstains. Closing my eyes, I could almost picture the gunfight between the Rictors and the Sand Demons. I turned my attention to the back half of the subway car. A wide thick blanket hung from the ceiling, cutting off my view into the rear portion. Come on now, you didn’t expect me to give away the secret that easily did you? Suffice it to say die Glocke is at the source of a mystery that extends back to the Second World War. Some people will kill to have it, others will kill to keep it hidden. And my hero Cy Reed, well, he’s got his own plans for the Bell. That’s all for today’s entry in the Chao book club. Tomorrow, we’ll be looking at the history of a very strange urban sport…buildering, or the practice of free-climbing skyscrapers. I hope to see you there…it’s going to be exciting! On May 1, 1956, a hospital director in Minamata, Japan raised the alarm. Almost a dozen residents were showing strange symptoms, namely difficulty with walking and speaking as well as physical convulsions. As the months rolled on, more victims of Minamata Disease were discovered. And even worse…these people were dying at a terrifying rate. For a few years in the 1950s, Minamata Disease baffled health officials and horrified citizens. Minor symptoms included loss of muscle control, numbness, hearing impairment, and slurred speech. More serious symptoms included insanity, coma, and death. And humans weren’t the only ones with these symptoms…investigators also discovered a malady the locals called “cat dancing disease” in which cats would go into awful convulsive fits and die. In addition, there were reports of disappearing seaweed as well as dead crows and fish. Since the strange outbreak seemed to be centered around Minamata, it was assumed to be contagious. Researchers from Kumamoto University canvased the area and by October 1956, had discovered a total of 40 victims. 14 of these victims had died, indicating an eye-raising mortality rate of 36.7%. And the disease didn’t stop there. So, what was the source of this strange and deadly disease? An unknown pathogen? A mutated virus? Not by a long shot. After a thorough investigation, researchers concluded that Minamata Disease was caused by metals. That’s right. The horrid, mysterious disease that plagued Japan was, in actuality, heavy metal poisoning or to be more specific…mercury poisoning. It turned out that a company named Chisso Corporation operated a chemical factory in the area. Beginning in 1932, it pumped wastewater into the Shiranui Sea, which encompassed the Minamata Bay. Methylmercury accumulated in the shellfish and fish that lived in the Sea. These creatures, in turn, were eaten regularly by local citizens. Chisso Corporation failed to cooperate with the official investigation and funded alternative research efforts to identify another cause. Worse, they performed their own investigation, realized that their wastewater was the cause of the disease, and ordered researchers to cover up the results. Even worse, they deliberately installed a wastewater treatment system that they knew was ineffective in order to placate anxious health officials. That’s not to say that Japan’s government was completely innocent in the matter. Although it knew the true source of Minamata disease by 1959, this information wasn’t released to the public until 1968. And although it realized that local citizens were still contracting mercury poisoning, it failed to warn these citizens or take any actions to stop Chisso’s continued pollution of Minamata Bay. I wish I could say that this story had a happy ending. Unfortunately, that’s not the case. A settlement was reached in 2010, covering 2,123 victims. However, other lawsuits continue. More importantly, many citizens are already deceased and the survivors continue to suffer due to the fact that no cure exists for Minamata Disease. Slowly, I turned my head in a circle. Strange eyes stared at me from the darkness. Slowly at first, then faster. Body odor and dried urine filled my nostrils. Hands grabbed at my shirt, pawed at my arms, scratched at my face. I released my grip. Rising to my feet, I found myself surrounded by hot, sweaty bodies. Eyes flashed at me. Bruised faces quivered with anticipation. Punching wildly, I connected hard against a fleshy surface. A face vanished but another one rose to replace it. They pressed against me and I fell backward, blanketed by the bodies. Amongst the mess of flesh and hair, I saw tiny, revolting details. Crippled hands with bent, inflamed joints. Cy Reed’s efforts to locate the source of the strange disease that plagues the Colony leads him to a secret underground laboratory that’s been lost for decades. Well, that’s it for today. Tomorrow, we’ll be taking a trip back in time to Nazi Germany. We’re going to take a fascinating look at one of the most sinister and mysterious devices in the history of warfare…die Glocke. I hope to see you then! On February 10, 1935, a 16 year old boy named Salvatore Condulucci was shoveling snow into an open manhole. Suddenly, he saw movement and shouted, “Honest, it’s an alligator!” But are sewer alligators real things? Or is this just an urban myth? I actually mention the 1935 sighting in my book. It’s perhaps the most famous account of a sewer alligator living in New York City. According to the original newspaper article, Condulucci and his friends fashioned a slipknot and hauled the gator to the surface. It was surprisingly big, measuring almost eight feet long and weighing 125 pounds. Upon reaching street level, the creature, starved and cold, snapped at the boys with its powerful jaws. They proceeded to beat it to death with their shovels. Afterward, the neighbors speculated on the sewer alligator’s origin. They finally decided that it must’ve somehow taken refuge on a steamer in the “mysterious Everglades.” Then it sailed to New York where it fell into the water. It swam into a sewer conduit which led to its eventual discovery. After being killed, it was taken away by a sanitation truck to be incinerated. After a brief spurt of alligator sightings in New York during the 1930s, it would be almost seven decades before the next alligator was reported. In the summer of 2001, a small gator was caught swimming in Central Park’s Harlem Meer. But other than that, there’s not much to report…that is, unless we consider the stories of Teddy May. In his fascinating 1959 work, The World Beneath the City, Robert Daley recounts conversations he had with Teddy May, who is somewhat of a “sewer legend” in New York. May’s exact job title is uncertain although it’s believed he might have held the position of Foreman or District Foreman. According to May, he once discovered a colony of two-foot long sewer alligators. He believed that they had been sold by unscrupulous pet dealers to satisfy a Depression era fad for painted turtles. How did May handle this menace to his beloved sewers? May was known to be a yarn-spinner and most historians are doubtful that this “sewer safari” ever took place. In fact, these same historians usually doubt the veracity of the 1935 account as well. Back then, newspapers were known to print outrageous stories in order to sell papers. And the fact that the sewer alligator was incinerated before it could be photographed does merit some suspicion. But could an alligator survive in the sewer? The answer seems to be yes. While New York’s above-ground climate isn’t conducive to gators, its sewers are an entirely different matter. Sewers are actually quite warm, due in part to decomposing waste, and a gigantic rodent population is readily available as a source of food. Suddenly, the alligator reared upward. The movement was so fast I didn’t have time to react. Its head turned toward me and I saw its eyes. They were red as blood, yet dark as night. As I stared into them, I felt like I was looking into the soul of the devil himself. The gator lunged at me. My instincts took over and I dove to the south. As I rolled through the water, I seized the machete from my waist with my free hand. I rose to my feet. The gigantic alligator was just a few feet away. I backed up, trying to get some breathing room. I backed up farther. It continued to follow me, gnashing its teeth in the process. Looking down, I studied the small puny objects in my hands. That alligator, as you’ll find out, is far more mysterious and deadly than even Cy realizes. Well, that’s it for today’s entry in the Chao book club. Tomorrow, we’ll be leaving New York City and traveling to Japan in order to peel back the layers of the mysterious Minamata disease that plagued that country during the 1950s. I hope to see you then! Deep below Manhattan, an abandoned subway track gathers dust. At the end of Track 61, a rusty subway car rests quietly. Popular rumor holds it was President Franklin Delano Roosevelt’s personal car. Supposedly, it was used to help him secretly enter the Waldorf=Astoria without revealing that he was partially paralyzed. This subway car is considered by many to be the Holy Grail of urban exploration. But is it the real deal? Or just a myth? On May 8, 2008, Matt Lauer of the Today Show visited Track 61 for a segment called “The Mystery of Track 61.” At one point, he examined a mysterious bulletproof car located at the end of the track. An MTA spokesman declared that it was FDR’s private subway car. Is this true? Although it made great copy, most rail historians consider the story to be false. President Roosevelt did ride in a private subway car called the Ferdinand Magellan. But the Ferdinand Magellan now resides in Florida, not New York. Also, there is no evidence that FDR ever used the platform. According to Joseph Brennan, the earliest surviving story to that effect came from author William Middleton in 1977. So far, Brennan has been unable to find confirmation of the story. So, what is this car then? The most likely theory is that it’s an old Pennsylvania Railroad express-baggage car from the 1940s. It was probably left behind for servicing. Thus, it appears that FDR’s lost subway car is, in fact, nothing more than a legend. The story of FDR’s lost subway car has taken on a life of its own and as I mentioned earlier, it is considered somewhat of a Holy Grail to urban explorers. 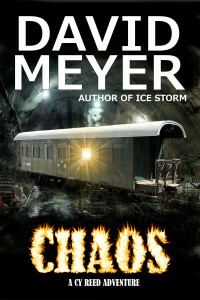 When I wrote Chaos, I wanted Cy Reed to pay a special visit to the subway car. Unfortunately for him, he wasn’t the only one in the area. Cold, stiff fingers wrapped around my neck, choking off my reply. My head flew to the side, bashing into the door. Foggily, I reached for my belt. But my machete was missing. With my head plastered to the door, I twisted my eyes to the side, seeing a murderous gaze staring back at me. My eyes bulged as they caught a glint of light. I didn’t know the man who held it. But I knew what he wanted. He wanted to kill me. In real life, the area around Track 61 once held a squatter community, similar in some respects to the Colony from Chaos. According to Brennan, “inflation and a poorly thought-through campaign to cut down on single room occupancy buildings” caused an increase in homeless people, some of whom relocated to the Waldorf platform. Well, that’s all for today. Tomorrow, we’ll be moving to another New York City topic from Chaos, one that touches on cryptozoology. Alligators in the sewer! I hope to see you then! In 1993, Jennifer Toth wrote The Mole People: Life in the Tunnels Beneath New York City, which chronicled an orderly society of homeless individuals living deep under New York’s busy streets. The book was an instant hit and yet, garnered tons of controversy. Was her work accurate? Do “Mole People” really exist? Beginning in 1974, homeless people began to move into Manhattan’s Freedom Tunnel, an abandoned structure located under Riverside Park. By 1991, a large and boisterous shantytown had sprang up, leading to complaints from residents. New York City responded by bulldozing the rickety homes, cordoning off the tunnel, and evicting hundreds of homeless people. These individuals became the inspiration for Jennifer Toth’s critically-acclaimed The Mole People: Life in the Tunnels Beneath New York City. Still, although Toth’s book was more fiction than non-fiction, the Mole People were all too real at that point in time. In 1990, John Tierney described the Freedom Tunnel and its residents in the article, In Tunnel, ‘Mole People’ Fight to Save Home. I’m fascinated by “lost tribes.” So, the idea of the Mole People as a sort of lost tribe of underground denizens has always intrigued me. When it came time to write Chaos, I wanted to incorporate my own version of the Mole People. Thus, the Colony and its mysterious leader Ghost were born. But as those of you who are reading the book know, the Colony members aren’t your typical Mole People. 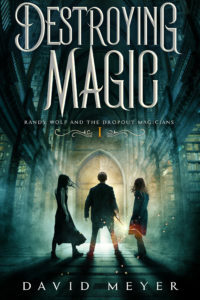 They’re hiding a secret…one that might kill them. I hope you enjoyed today’s entry in the Chaos book club. Tomorrow, we’ll be stepping a little further back in time to examine the legend of President Franklin Delano Roosevelt’s Lost Subway Car. I hope to see you then!